This week the "Worth Emulating" Focus Word I have chosen is FORGIVENESS. Imagine how much easier this Earthly life would be if we were all more willing to forgive. Think about the pain and heartache that could be left behind if we were simply willing to LET IT GO. When we hold on to grudges and refuse to forgive, we are the ones who end up hurting the most. "The poison in us is not killing them." Not only is it unnecessary pain that we can and should let go of, we are also breaking a commandment if we are not willing to forgive others. Each of us is imperfect. We all make mistakes therefore we are all in need of forgiveness. If we expect and desire to be forgiven we must be willing to forgive others. Christ was the ultimate example of forgiveness. As he was on the cross, after he had just suffered incomprehensible pain, he said ..."Father, forgive them, for they know not what they do." Luke 23:34 We need to follow in our Savior's footsteps and forgive those who mistreat and offend us. We are not expected to go through these trials alone. Christ suffered for us so he could fully comprehend all of our heartache and struggles. What baggage can you lay at the Savior's feet this week? Turn to him for strength to forgive and let go. 1. 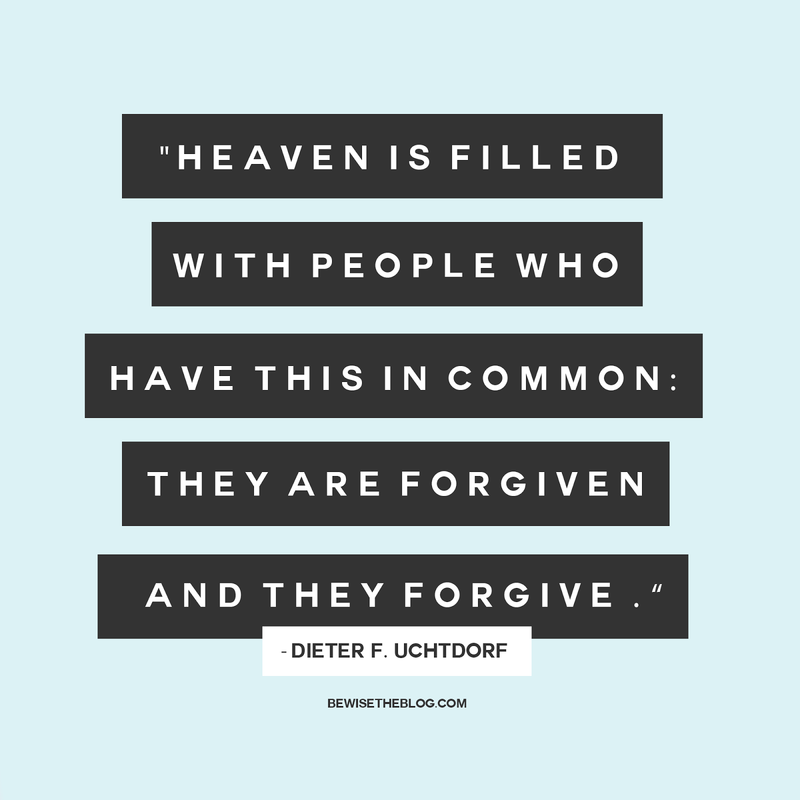 When in your life have you needed to be forgiven ? 2. Who can and should you forgive? 3. What is something you can and should forgive yourself for? 4. In what ways are the grudges you're holding on to hurting you?